Le Dirt Antiquing Dust is a special detail that makes your painted finish look Authentic and Unique. This powder aids in polishing wax topcoats to a subtle sheen and settles into crevices as if collected over the centuries. Imagine an old salvaged furniture piece that has been sitting in a dusty attic. A fine layer of dust has settled into the nooks and crannies. This is the effect that Le Dirt Antiquing Dust will help you accomplish. 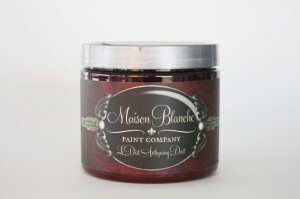 Use Le Dirt in conjunction with other Maison Blanche Paint Company products to create a believably authentic, delicately aged finish. To Use: Start by applying a very thin coat of Maison Blanche Paint Company Antique Wax to piece that has been painted with our Furniture Paint, concentrating on crevices. Let the wax set up for ten minutes. Use a coarse brush to press Le Dirt into the Antique Wax layer, covering the entire piece. Allow to sit for 30 minutes. Gently dust off excess Le Dirt and buff high points with a soft cloth using gentle pressure.